We are an establishment reserved for libertine couples or their sympathizers, & for single women and to some single men who respect the rules of Libertinism etiquette. Minors are not welcome at the establishment. 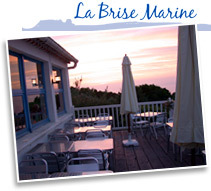 Located on the heights of the island of the Levant, in the East of the archipelago of the Islands of Hyères, La Brise Marine, accomodates you in one of its 14 rooms, with sight on sea, equipped with individual bathroom and toilets. 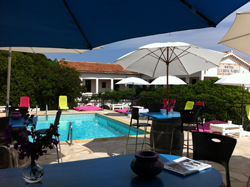 From the terraces, you will benefit from a marvellous sight on the littoral of the Var's department. Its Andalusian patio and its swimming pool await you for moments of relaxation, you will be able to also find you around a lunch in terrace at midday within a superb framework . 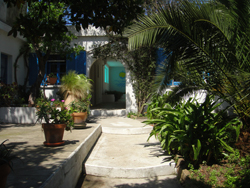 The island, glaze of a various and abundant vegetation which extends on 8 km, is the naturist field of Héliopolis, universally known since 1931, date of its creation, with in the center, the village of the Cane-apple bushes. The Levant's Island was always a privileged place. Naturism is free everywhere, except in the public places, on the Port and the Place of the Village, it is obligatory on the beach of the Caves and on the edges of sea. In a mutual respect and a tolerance, the Levantines thus hope to bring to naturism the visitors come to admire this exceptional site. Héliopolis is a real village with its church, its school, its council, its post-office and a natural reserve. This village preserved its rustic character (without posts, neither street lighting, nor neon sign). It can welcome its hosts in best desired comfort but the flashlight, with the "minimum" or the paréo, are part of the panoply of the perfect "Small Levantine".